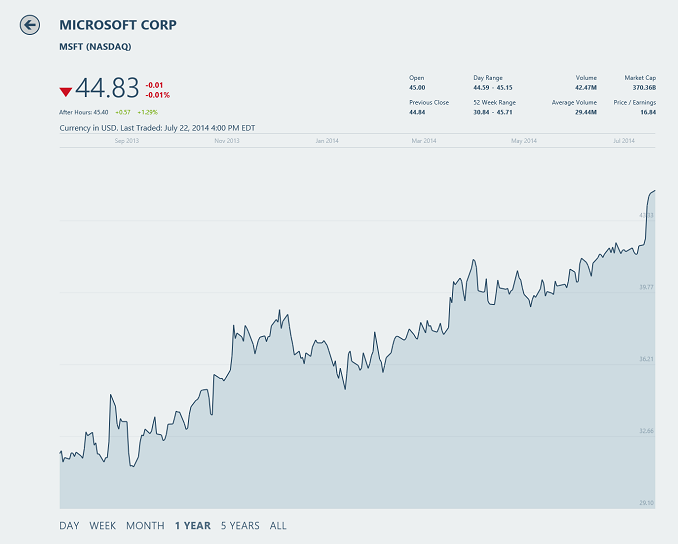 This afternoon Microsoft held an earnings call to announce the results of their fourth quarter for fiscal year 2014. Strong growth in Microsoft’s cloud offerings offset a loss by the recently acquired Nokia Devices and Services to contribute to an overall GAAP revenue of $23.4B, up 18% from Q4 2013, and up 15% from Q3 2014. Gross Margin came in at $15.8B which is 67.5%, with an operating income of $6.5B and net income of $4.6B for the quarter. Operating income was up over Q4 2014, but net income was down due to an additional $785M set aside for income taxes. Diluted earnings per share was $0.55, which missed analysts’ expectations of $0.60. For the quarter, $3.4B was returned to shareholders which was a 17% increase from last year. The Devices and Consumer lines came in with good results for the quarter, with the caveat that Q4 2013 included the $900M write down of Surface RT inventory which skews the results somewhat. Devices and Consumer Licensing contributed $4.7B to the overall revenues and $4.4B to Gross Margin with both values being higher both sequentially and year-over-year. Windows OEM revenue was up 3% with a split of an 11% increase in Pro revenue combined with non-Pro revenue being down 9%. The non-Pro decrease can likely be at least somewhat attributed to offering Windows free for certain devices now. Office Consumer revenue was up 21% compared to Q4 2013, and Windows Phone revenue was up 95% due to no longer having to pay for the commercial agreement with Nokia. As for consumer hardware, revenue was up 23% from Q4 2013 at $1.44B but down from the $1.97B last quarter, and Gross Margins increased 103% year-over-year to $0.02B which is also down from $0.26B last quarter. The large increase in Gross Margin is attributed to the Surface RT right off last fiscal year and Microsoft also took a hit for not shipping a new form factor this quarter which is likely the rumored Surface Mini, which didn’t ship as expected with the Surface Pro 3. Overall Surface revenue was $409 million for the quarter. Xbox sold 1.1 million consoles this quarter, and had a 14% increase in revenue driven by increased console revenue. The new segment to Devices and Consumer hardware is the Phone Hardware, which contributed $1.99 billion in revenue but the new Nokia division came in at a $692M loss. Microsoft reported sales of 5.8 million Lumia Smartphones, and 30.3 million other phones. The final piece of the consumer division is D&C Other, which includes Office 365 Consumer, Resale, Windows Store, Xbox Live, Bing, and a few other offerings. Revenue for this segment was up $20% year-over-year at $1.88B, but down from the $1.95B in Q3. Gross Margins were also up 21% from last fiscal at $0.45B. Microsoft added an additional 1 million new subscribers to Office 365 Home and Personal, which now totals 5.6 million subscribers. Bing advertising revenue was up 40% due to higher revenue per search, higher search volume, and an expiration of payments to Yahoo from last year. Bing search share is now at 19.2% in the US, up 130 basis points from the same time a year ago. The commercial side is where Microsoft makes the majority of its revenue, and this quarter is no different with overall revenue coming in at $13.48B for the quarter which is an increase of 11% year-over-year. Gross Margin was also up 10% at $10.99B for the quarter. Commercial is broken down into Commercial Licensing and Commercial Other, with the former being up 6% to $11.22B in revenue and the latter up 44% to $2.26B. Commercial Licensing includes revenue for on premise offerings such as Server 2012, SQL Server, and System Center, while the Other segment is for cloud offerings and services which grey 147% from the same period last year. So what can we learn from this quarter? Clearly Microsoft is well positioned going forward to continue its play in the enterprise, with cloud services in particular being a strong point. No other cloud provider has the product offerings which can compete for the hybrid cloud model of on premise servers running alongside cloud offerings, and they are leveraging this strength to make substantial gains in this sector. As for the consumer offerings, we now see why such drastic action was taken last week with the downsizing of the Nokia division in particular, which lost almost $700 million this quarter. A lot of the job cuts were aimed at manufacturing, and those will likely be aimed towards locations that created the non-Lumia smartphones. Earnings for the quarter were right in line or slightly over the projected results provided last quarter, assuming the Nokia earnings and loss are excluded because they were not a part of Microsoft when the projections were made. Microsoft as a company has traditionally been used to the high margin software business, and the recent push to be a hardware manufacturer has shown that this is a low margin, high risk playground with all of the major losses being in hardware. With a new CEO at the helm for the full FY 2015, we’ll have to see what his vision and patience are for the hardware segment.